642 pages. Alfred A. Knopf. $37.50. 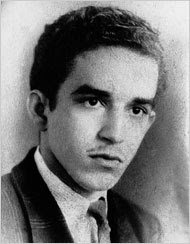 The author Gabriel García Márquez in the mid-1940s. He compressed that sprawling magnum opus into 545 pages (plus notes and index), a “brief, relatively compact narrative,” so it could be published “while the subject of this work, now a man past 80, is still alive and in a position to read it.” Both author and subject have been treated for lymphoma, Mr. Martin says. Could any biographer have been better suited to this gargantuan undertaking? Absolutely not: Mr. Martin is the ideal man for the job. He has already written studies of 20th-century Latin American fiction; translated the work of another Latin American Nobel laureate, Miguel Ángel Asturias; and written about Latin American history. These are essential prerequisites for unraveling the labyrinthine cultural and political aspects of Mr. García Márquez’s peripatetic life. So are Mr. Martin’s demonstrable patience, wide range of knowledge and keen understanding of his subject’s worldwide literary forebears, from Cervantes to Dostoyevsky to Mark Twain. Read the rest of Maslin's full, detailed NYT review here. And for a UK review this from The Independent.